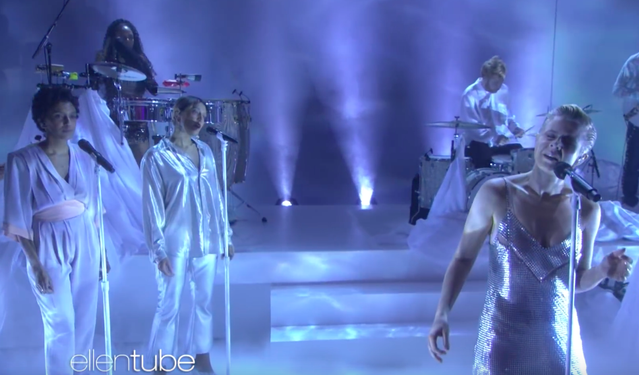 Robyn was the latest performer on today’s episode of Ellen. She brought the Honey-closer “Ever Again” to life on stage against a cold, blue backdrop, with backup singers and her band all clad in shimmering silvery-white. Robyn recently released a new Max Vitali-directed video for the track “Send To Robin Immediately.” Honey is Robyn’s sixth full-length album and her first since 2010’s Body Talk. She is currently on a world tour, with a show at Madison Square Garden scheduled for March. She recently appeared on a new song with Beck and the Lonely Island, “Super Cool,” for the Lego Movie 2 soundtrack. Watch her “Ever Again” performance on Ellen below.